A funky robot band called the End of Life, or EOL for short has been recorded playing a cover of Marilyn Manson’s “The Beautiful People”. 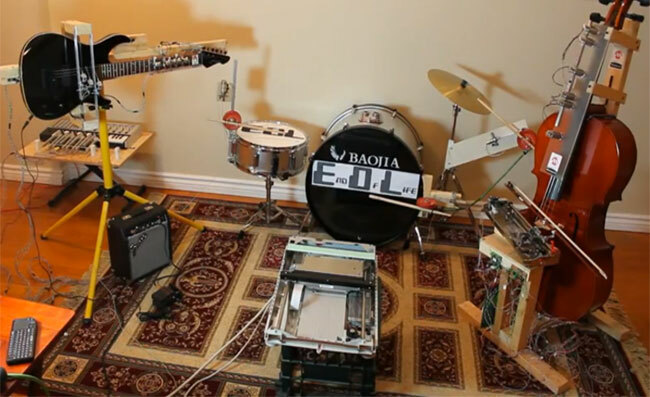 The ELO band consists of a robotic cello, electric guitar, drummer, together with a scanner. Watch the video after the jump to watch how well the robot band performs the cover, however no information has been released as yet regarding tour dates. The video took around two months to record and program the instruments and its creator says that there might be another video in the making detailing the circuits, parts and tools which were used to construct these amazing musical robots.